Lay-Flat Slice Scissors By Karim Rashid | OhGizmo! By Andrew Liszewski on 03/09/11 • Leave a comment! It’s no secret that I’m a sucker for a nice bit of industrial design, but who isn’t? It’s not like the unibody MacBooks are the best bang for your buck, but Apple has no problem selling them. 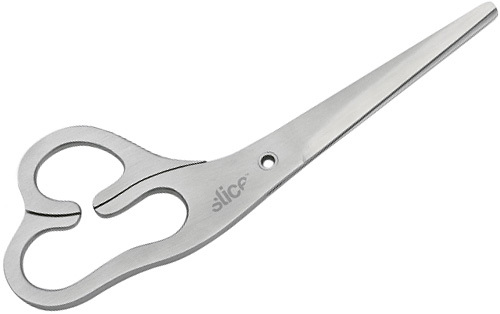 Back in September of ’09 we reviewed Slice’s line of ceramic kitchen and office cutting tools, and walked away suitably impressed not only with how they performed, but how they looked and how cheap they all were. Well the latest addition to the Karim Rashid-designed Slice line are these lay-flat scissors that are friendly to both lefties and righties. Instead of ceramic blades they’re made from Japanese stainless steel with hand-polished finger grips, which probably has something to do with their slightly higher $24.99 price tag. But damned if they won’t look good sitting on your desk, even if the lay-flat design makes them tricky to pick up.